Much to the disappointment of pretty much everyone, we have yet to perfect the science of teleportation and no one has bothered to invent Futurama-type human pneumatic tubes. Until those things become reality, we are stuck walking, biking, or riding almost everywhere. At least these three human transport systems are weird enough to be interesting, which will just have to do for now. 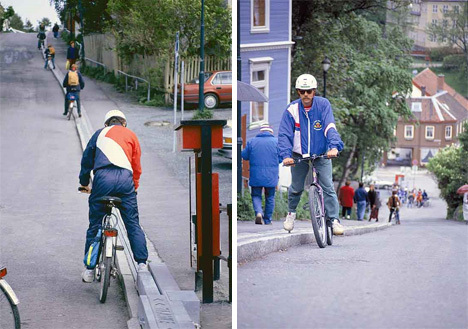 In bicycle-friendly Trondheim, Norway, a curious contraption adorns a steep hill. 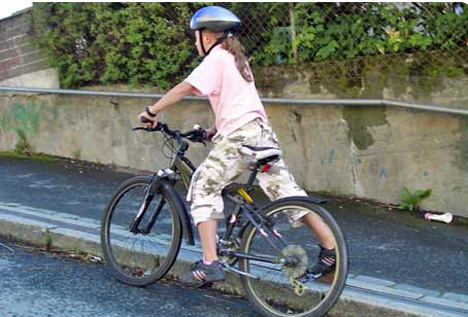 It is the world’s only functional bicycle lift, designed to help bike riders ascend the hill quickly and easily with a minimum amount of stress on their muscles. Built as a sort of working prototype, the Trampe (meaning “to stomp” in Norwegian) Lift was installed in 1993. 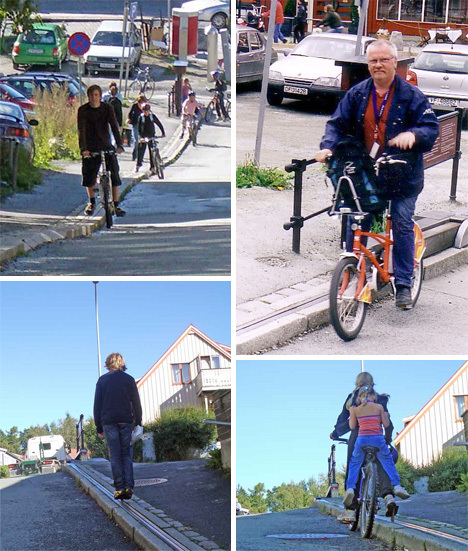 Inspired by Trondheim’s large student population and very hilly topography, the Trampe’s inventor, Jarle Wanvik, first came up with the bike lift idea in 1992. He envisioned the lift working like a ski lift, taking bikers from the bottom of a hill to the top with a minimal amount of effort. Since Trondheim had recently invested large amounts of money in a number of pro-bicycle city improvements, the Public Roads Administration loved the idea. After choosing a manufacturer and working out the details of the plan, Wanvik and the Municipal of Trondheim chose a suitable hill. The hill that would eventually become a bike commuter’s dream and a tourist attraction for the city is located near the town center and leads up to the university campus. The location is perfect for students and commuters alike. Keycard passes for the lift cost 100 Kroner per year for residents, but one-time cards are free for tourists. 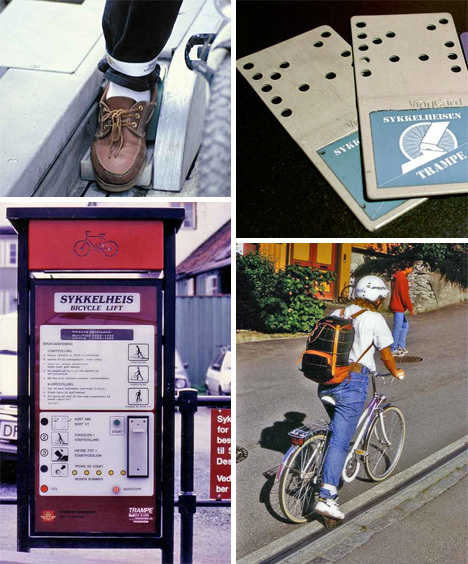 The bike lift works in a very straightforward way: a cyclist puts his right foot on the starting point with his left foot still on the left bike pedal, then inserts his keycard in the card reader machine. After pushing the “start” button, a footplate emerges behind the right foot and begins to propel the rider up the hill. It looks precarious and tiring, but the trick is to keep the right leg extended behind the body, shift the body weight to the footplate, and lean slightly forward on the bike. Riding the lift in this way, says the manufacturer, prevents any fatigue and makes for a pleasant assisted uphill ride. So why isn’t this great idea employed elsewhere in the world? According to the official Trampe website, it’s not for lack of interest by other cities. The idea has been well received by locations all over Europe, Asia and the US, with many cities promising to install one in the future. But before that can happen, the overall bicycle infrastructure has to be ready to support such an endeavor. For many cities, that means installing dedicated bike lanes on the streets before undertaking an ambitious project like a bike lift. 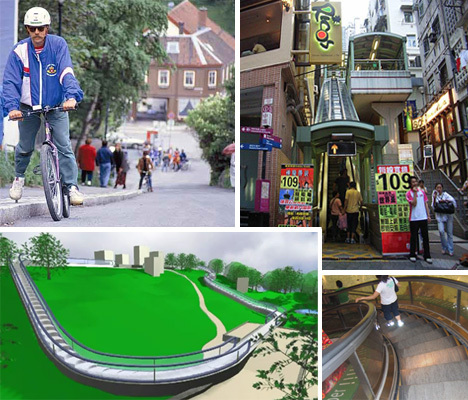 Hong Kong is another urban environment full of steep hills and difficult-to-maneuver terrain. 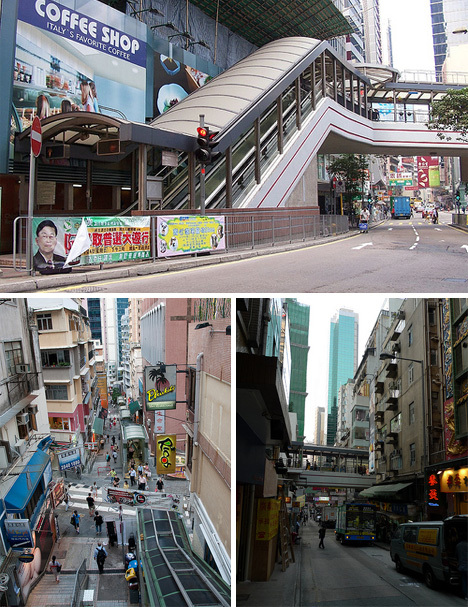 To make commuting easier between the Central and Western Districts of Hong Kong Island, the world’s longest covered outdoor escalator system was built. In the late 1980s Hong Kong officials were troubled by the increasing vehicular traffic in the residential Mid-Levels. Seeking a radical solution to the problem, they decided to pedestrianize the area with a series of 20 escalators and three moving sidewalks. 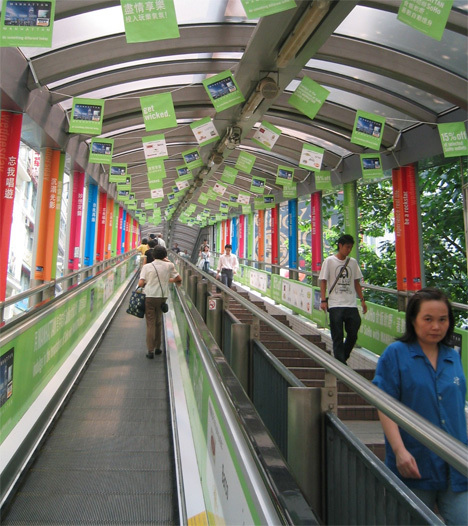 The entire escalator system is more than 2600 feet (800 meters) long and covers a vertical climb of 443 feet (135 meters). If you were to travel the entire system from one end to the other, the trip would take around twenty minutes – a considerable improvement over the time it would take to travel the same distance by car on zigzagging roads. Exits at every road give travelers the chance to step out and stop at any of the many restaurants and shops that have sprung up around the system. To facilitate the morning commute, the escalator system flows downhill from 6:00 am to 10:00 am. 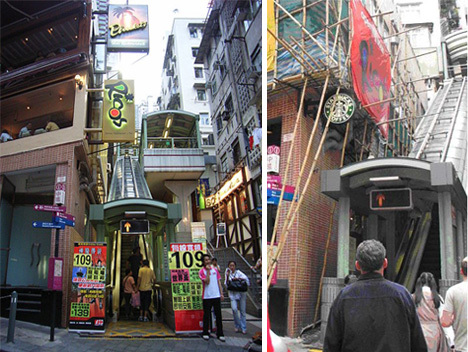 The direction then reverses and the escalators run uphill until midnight daily. Although the system was only designed to handle around 27,000 people daily, it sees actual usage of more than double that. The escalators have proven a valuable resource for not only unclogging urban streets, but for increasing traffic to older neighborhoods and even serving as a tourist attraction. A side effect of this unusual urban transit system has been the revitalization of neighborhoods that used to be remote and difficult to reach. While the higher-elevation areas were once filled with industrial buildings and low-rent apartments, they have now become some of the trendiest areas of Hong Kong. Providing simple, free transportation for commuters, tourists and residents has proven to be a smart move for Hong Kong, despite the critics who have called the system a colossal waste of money. Since the very first escalators were built and installed, engineers have been trying to figure out how to get them to work in configurations other than the standard straight-up-and-down. 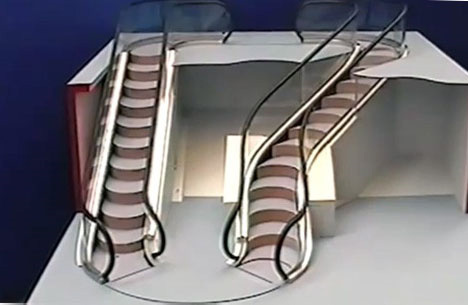 The configuration of choice is the spiral, which would take up far less space than straight escalators and could be installed in a wider variety of locations. Curved escalators like the ones pictured above are as close as we have been able to get, and even these still have the same problems as standard escalators: they take up enormous amounts of space and they aren’t the true “spirals” that engineers want to create. But why do spiral escalators matter? Aren’t they just staircases for lazy people? 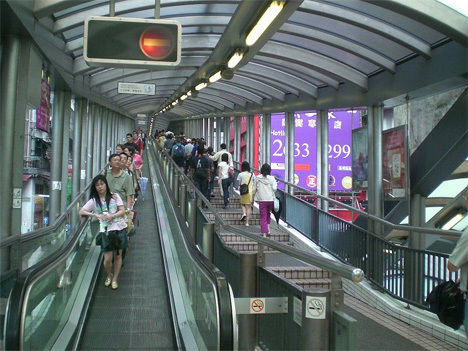 Actually, the importance of escalators in maintaining manageable urban traffic is often underestimated. These moving staircases can transport large numbers of people in roughly the same amount of floorspace taken up by a comparable flight of conventional stairs. They help people with mobility issues get around in areas where an elevator just wouldn’t fit. Curved escalators are, themselves, a feat of engineering – but the overall escalator design has long been due for an overhaul. Finally, an engineer has come up with a viable solution to the spiral escalator dilemma. London professor Jack Levy has created a system that he calls “the Levytator,” a surprisingly flexible escalator system that takes up very little space, can be installed in already-existing buildings and can take on just about any configuration. Unlike traditional escalators, the ingenious new design does not require a large mechanical room beneath the system to keep it moving. The stairs are on a continuous loop above the floor, which sets this design apart from traditional escalators where half of the steps are unused at any given time. Thus, the cost per step is much lower than traditional escalator designs and no excavations are required to install this system in an existing building. There is virtually no limit to the size and shape of the loop, and because the stairs turn into a moving sidewalk when flat the system can be installed to move people around all kinds of indoor and outdoor displays.